Millions of small and mid-size businesses use QuickBooks for accounting purposes. While QuickBooks is an excellent tool for managing finances, it doesn’t do a good job of tracking inventory by itself. That’s because QuickBooks does not have the right tools to be an effective manufacturing inventory tool. To fill this important need, manufacturing inventory software has been developed. Good manufacturing inventory software builds on QuickBooks’ inventory management features and allows manufacturers to continue using their accounting software. Integrating with QuickBooks creates a powerful QuickBooks manufacturing software tool for manufacturers to increase their efficiency and productivity. 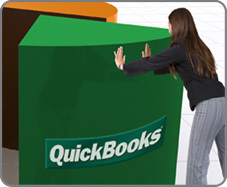 QuickBooks manufacturing software eliminates the frustrating task of double data entry. Manufacturing inventory software, integrated with QuickBooks, allows employees to scan a product or part once and enter it automatically into both databases for accounting and inventory-management purposes. This simplifies the ordering and receiving process. In addition, QuickBooks manufacturing software cuts the risk of making serious errors in processing product orders and deliveries. Scanning barcodes is faster and more accurate than typing product numbers by hand. Once products are scanned, a Bill of Materials and other documents can be generated automatically.